Quantum secret communication realizes secure information transmission based on principles of quantum mechanism, which is an important field in quantum information sciences and technologies. At present, the most developed quantum secret communication schemes are based on quantum key distribution. In these schemes, the quantum function is limited to realize secret key generation and transmission, while the information transmission still depends on classical communication technologies. These schemes developed rapidly in recent years, which are mature enough to start commercial applications. On the other hand, researchers in the field of quantum communications still devote their efforts into exploring novel communication schemes based on quantum information theories and technologies, which are beyond quantum key distribution. A representative topic is quantum secure direct communication (QSDC). The first QSDC protocol is based on quantum entanglement, which is proposed in 2000 by Prof. Long in Tsinghua University, China. It has been deeply investigated theoretically, however, there is no break though in experiment for this protocol. The reason is that it requires many complicated quantum functions such as entangled Bell state generation, Bell state measurement and quantum memories for photons, which are difficult to be realized, especially at telecom band. Recently, Prof. Zhang's group in Tsinghua University and Prof. Sheng in Nanjing University of Posts and Telecommunications realized the first entanglement based QSDC experiment based on technologies of fiber optics, in which two optical fibers of 500 meters are used as quantum channels. 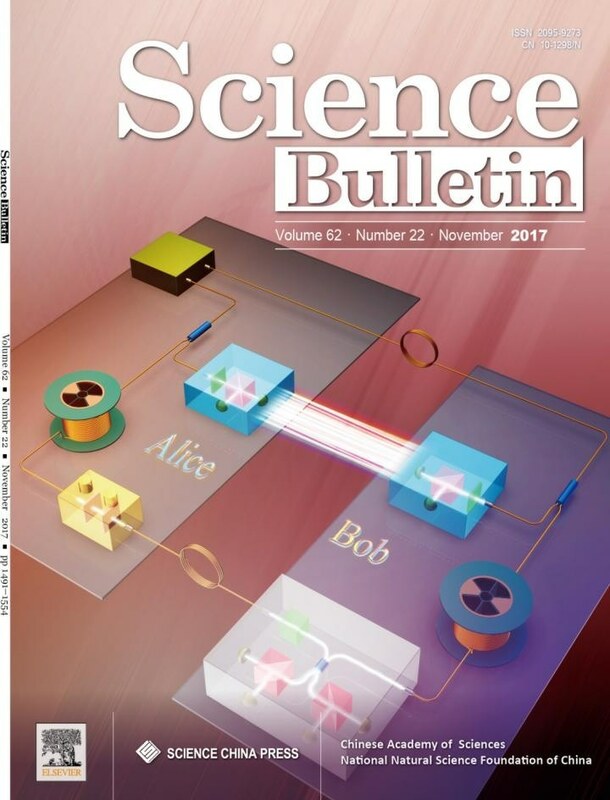 The Cover shows their experimental system of quantum secure direct communication over optical fibers. Firstly, according to the requirement of entanglement based QSDC, they proposed and developed a novel fiber based quantum light source for polarization entangled Bell state generation at telecom band. The key point of this quantum light source is how to split the two photons in a pair, which are both polarization entangled and frequency degenerate. The researchers introduce vector spontaneous four wave mixing effects into a fiber Sagnac loop bi-directionally, splitting the two photons in a pair by the two-photon interference effect at the output ports of the fiber Sagnac loop. This quantum light source paves the way to realize the entanglement based QSDC over optical fibers. Then, the researchers establish the experimental system for entanglement based QSDC based on technologies of fiber optics, realizing the polarization entangled Bell state measurement system by fiber components and using dispersion shifted fibers as the quantum memories for photons. In this system, they demonstrate two crucial functions of entanglement based QSDC successfully, security test by the measurement of polarization entanglement and encoding/decoding processes based on the manipulation and measurement of the polarization entangled Bell states. Experiment results show that the entanglement based QSDC could be realized over fiber links. This work is the first entanglement based QSDC experiment with full functions, using optical fibers of 500 meters as the quantum channels and realizing all the functions based on technologies of fiber optics, including polarization entangled Bell state generation and measurement, and the quantum memories. It shows that QSDC can be realized by on-shelf technologies of optical communications, which is preferred to its future applications in optical fiber networks. Theoretical analysis shows that the scheme in this work has the potentials on applications in metropolitan, access and local networks. This work has been looked as an important step stone for future application of QSDC, which has attracted broad attention.